Line prematurely announced the introduction of its chat app payment feature earlier this month, but now it has begun rolling out to its 500 million-plus registered users. 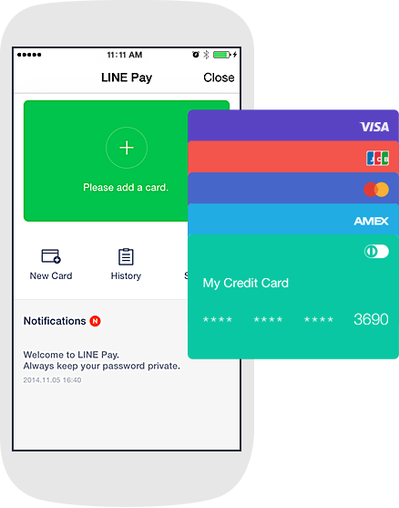 The full rollout is expected to take up to a month to reach all users, but those who got the option to bind their credit card to Line Pay early on have experienced some teething issues anyway, as Tech In Asia notes. Payments are not just about Asia — Snapchat has jumped on the wagon, while Facebook appears to have tested its own solution and Kik is also keen. Line said it works with cards from American Express, Diner’s Club, JCB, Master Card, and Visa. It will initially support payments in the Line Store — which sells stickers and themes — only, but the company plans to allow global users to make online/in-app purchases, send money to Line friends, and pay for goods offline in the future. Security is understandably a major concern. Line said it will require a unique 7-digital password for transactions, while users will be required to authenticate via their mobile (using a password or Touch ID on iOS) if they make payment via the desktop version of the service. Line Pay is an interesting new project because, beyond increasing convenience for users, Line stands to benefit if a large number of users sign up to it. Significant adoption lays down the potential to introduce new services, such as e-commerce services that it has tested in Southeast Asia, its upcoming music streaming service and more, in the knowledge that the payment barrier is significantly lowered because users’ bank cards are already bound to Line Pay.